I had intended to take this week off from posting, and in general IT publications are pretty boring. 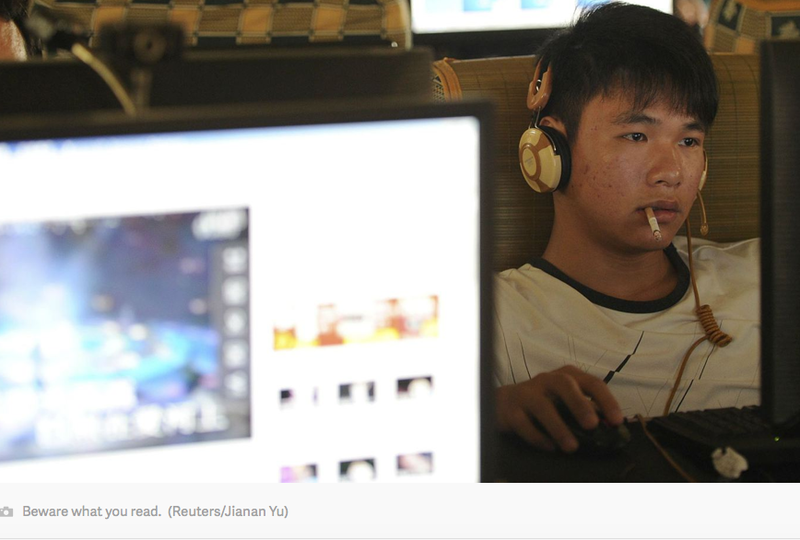 However the article “Hacked emails reveal China’s elaborate and absurd propaganda machine” (see http://qz.com/311832/hacked-emails-reveal-chinas-elaborate-and-absurd-internet-propaganda-machine/ - below the Computer Associates Ad and also the photo source) seemed to be the exception to both. The kind of effort described by the article is a long term effort best employed against connected and mainly urban societies. These kind of efforts are also typical of environments where government controls or seeks to control the information environment. While direct conflicts may not take place in these government controlled areas, it makes sense to understand how these tactics work and how they could conceptually be adopted or altered for our own advantage. For example would the same workers change their allegiance for 75 cents a posting rather than 50? “Words matter in ‘ISIS’ war so use ‘Daesh” was the head of an OpEd piece from the Boston Globe (see: http://www.bostonglobe.com/opinion/2014/10/09/words-matter-isis-war-use-daesh/V85GYEuasEEJgrUun0dMUP/story.html). In September FRANCE24 decided to use Daesh as well. Of course the name ‘ISIS’ is intended to convey an official status for what the terrorists hope will one day be recognized as a legitimate caliphate. According to FRANCE24 (see: http://www.france24.com/en/20140917-france-switches-arabic-daesh-acronym-islamic-state/) which is also the photo source. “Daesh is a loose acronym of the Arabic for “Islamic State of Iraq and the Levant” (al-Dawla al-Islamiya al-Iraq al-Sham).Use of acronyms is rare in the Arabic world, with the notable exception of the Palestinian group Hamas (Ḥarakat al-Muqāwamah al-ʾiSlāmiyya). First used in April 2013 by Arabic and Iranian media hostile to the jihadist movement, Daesh became a name commonly used by the enemies of IS, notably forces loyal to Syrian President Bashar al-Assad as well as activists and less fanatical rebel groups also fighting the Damascus regime. A principal reason for using the acronym was to remove the words “Islamic” and “State” in reference to the group in a bid to stop Muslims in war-torn Syria and beyond flocking to its ranks. 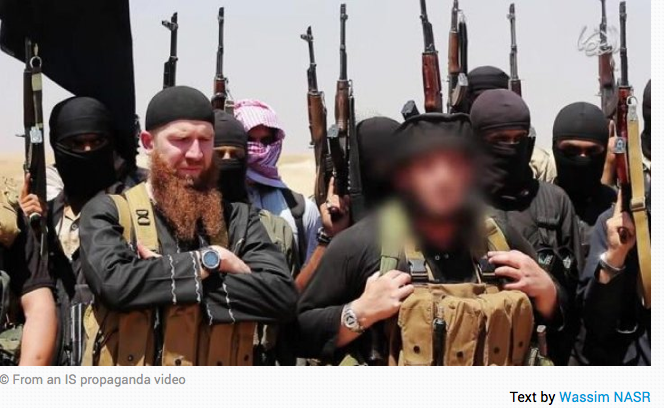 It is also considered insulting, and the IS itself doesn’t like the name Daesh one bit. I am not a scholar of the Middle East and so I cannot vouch for the correctness of the French assertions. I am only pointing out that words matter and that it’s worth considering using what influence we might have in a way calculated to give our enemies the least possible comfort. All of my best wishes for the 2014 Holidays and for a peaceful, healthy and rewarding 2015. Like many of you I get a fair amount of e-mail, some of it informational, some of it news, etc. Foreign Policy magazine is a magazine favored by policy wonks. 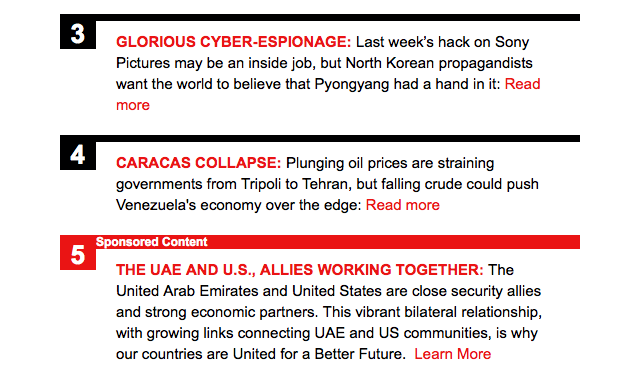 I get a couple of their newsletters - the item in red caught my attention today. The sponsor of the red item is "US/UAE". Propaganda or just some good information? Interestingly enough after I published today's post I came across an article by UPI "Why the US is losing the war against the Islamic state. They boiled it down to: "The Obama administration has preferred rhetoric and half measures so far because it was unwilling to re-engage in Iraq. Rhetoric is no substitute for action. To defeat IS decisive leadership and determined commitment are essential. Otherwise, the fight against IS will not be won. 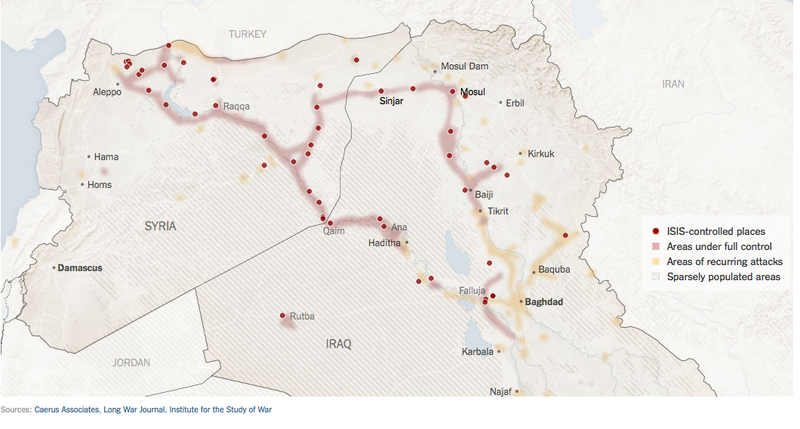 On December 5, 2014 the Washington Post published an article: “New US Military Command Established for Iraq and Syria Operations” (see “http://www.washingtonpost.com/news/checkpoint/wp/2014/12/05/new-u-s-military-command-established-for-iraq-and-syria-operations/). 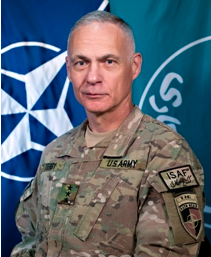 The article indicated that LTG James L Terry was designated CDR of Combined Joint Task Force (CJTF) – Operation Inherent Resolve in addition to his current duties as CDR of the Army Component of CENTCOM (ARCENT). Given the challenge facing him, LTG Terry is wise to gather his thoughts and resources first, figure out what impression he wants to make on the world stage, then enter it. Appointing a single CDR to deal with this threat is in keeping with the principle of Unity of Command and makes a great deal of sense on many levels. The rank of the CDR indicates a Corps Level Command which Normally implies a pretty big HQ element. In this I would argue that smaller would be better. Operations against ISIS need to be characterized by swiftness and flexibility. The enemy has interwoven itself into the civilian population and can ebb and flow within the population, as it needs to in order to defeat allied efforts against them. Non-kinetic efforts are absolutely critical in this battle. They need to be a key element of all operations conducted in the AO. Consideration needs to be given to the implications (in the minds of the civilian population) of all acts conducted in the AO. The PSYOP support must be equally supple. The range of MISO resources needed to support this new type of CJTF is mind-boggling. On one hand tactical elements are needed as is normally the case and on the other, strategic resources need to be on call to deal with events that have global significance such as murder of hostages, massacres and the like. GO HQ are often lumbering beasts often encumbered with big staffs and meetings upon meetings. This one needs to be different.